Please congratulate Mr. Dominic A. Dahlen, JR III for successfully completing his First Solo flight. With the casual demeanor of a well-seasoned pilot, he was able to navigate through severe VFR weather including murky visibility (of > 10 sm), low ceilings (> 12,000 ft), and even gale-force winds (of ~5 kts). The frigid and near-hand crippling temperature of 81 degrees was also a significant adversary. David made application at 42.7 total flight hours while the bare minimum aeronautical experience is 40.0. This is an extremely rare accomplishment as the national average is roughly 50-55 for all private pilot applicants, and even higher for (60-65) for technically advanced aircraft such as the SR20 – a clear indication of a motivated student and obviously gifted flight instructor. 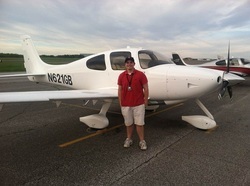 Take a moment to Congratulate Cirrus’ newest private pilot! Good job Cory Moran! David Artim successfully completed (3) solo takeoffs and landings in a Cirrus SR20. If you see David, please congratulate him on his accomplishment and encourage him to complete his written test in a timely manner.